This might be the best training run in California, partly because of reliable summertime flows, and also because the rapids increase in difficulty as the run progresses, allowing boaters to build up confidence. 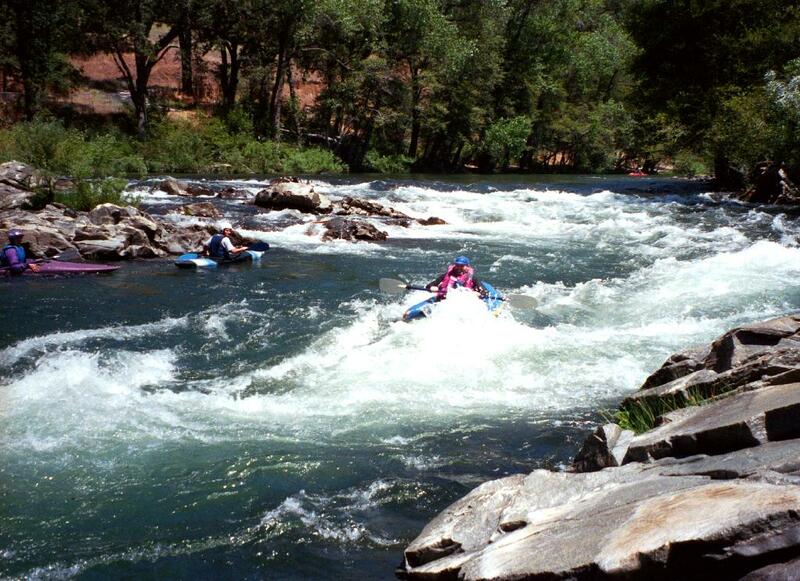 There is one of almost everything on this run: some shallow boulder bars, long stretches of riffles, a wrap-rock goalpost, a turbulent chute, an S turn, a bridge piling, a rock dodging channel, a sweeping turn, and finally, a steep falls into an underwater rock (scouting advised). However if you continue to the Middle Bar take-out, it then gets progressively easier. Taking out at Middle Bar more than triples the shuttle distance, so you might want to do the run only once if you take out there. Most people do this run at least twice in a day. Prevail upon your friends who drive pickup trucks or cars with good roof-top racks, so you can load your boats for a quick shuttle without deflating and reinflating. Finally in 2012, an official take-out is available near the Highway 49 bridge! Camping and cultural enrichment are available nearby at Indian Grinding Rock State Park, where native Americans practiced free trade before economists even thought about it. At one time this was the largest acorn paste factory in America. 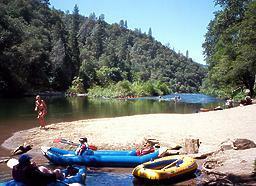 During the fall, weather is nice and campsites are less crowded than in summertime. 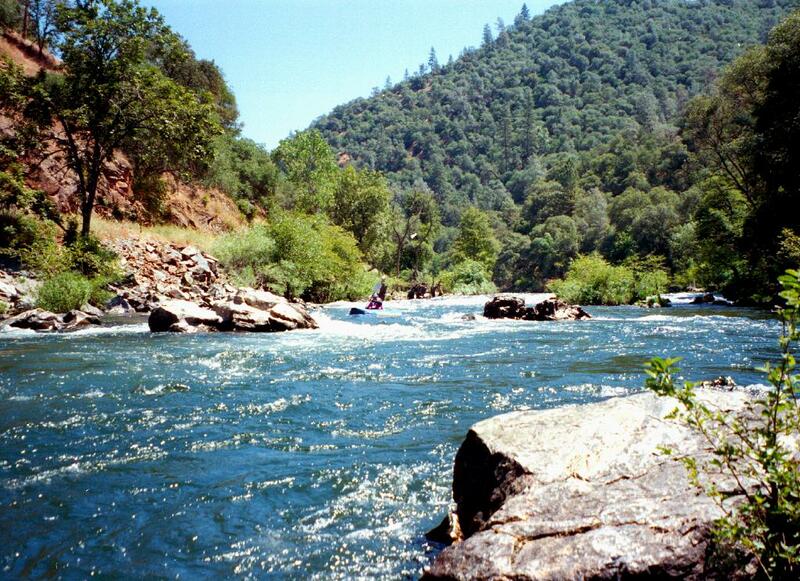 Beginners should stay off this river at high flows, when current goes into and thru riverside trees, making rescue difficult and swimming dangerous. At such times, there are many other good river choices. 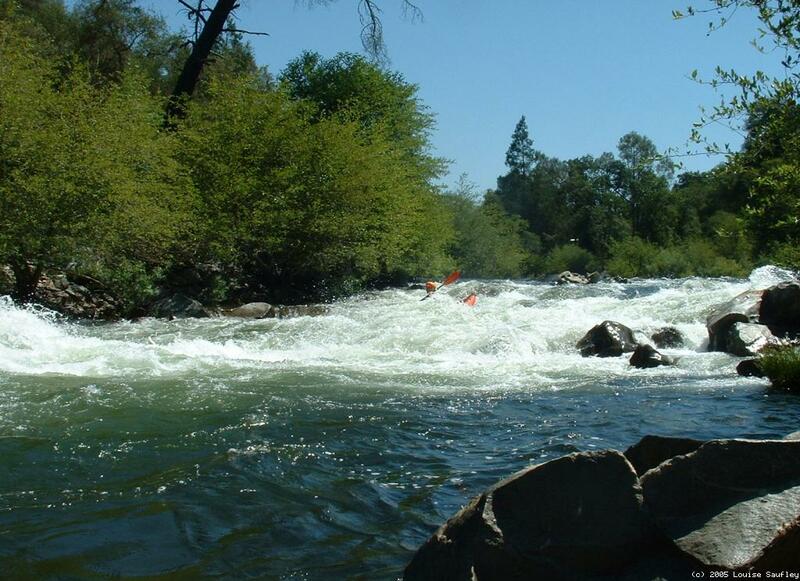 With very high flows, a whirlpool even develops near the bridge piling at mile 2.7! In December 2002, Katherine Evatt of the Foothill Conservancy reported that EBMUD was building a parking lot, sanitary facilities, and take-out at Middle Bar. Great news! This work is all completed. Under terms of a new hydropower license, PG&E also added more parking at Electra and new paths down to the river below the old beach put-in. Foothill Conservancy also worked with BLM, the State Lands Commission, and others to develop parking and take-out just below the Highway 49 bridge. You can rig your boats in the shade and carry them across the sandy beach to the cold river. If you are a beginner, a calm pool gives you an opportunity to get accustomed to your boat's handling characteristics. Wide and shallow boulder bar. Looking down at the varied rockbed sometimes makes you feel like you are flying. Goalpost move between two wrap rocks, after a long chute beside some willow trees. 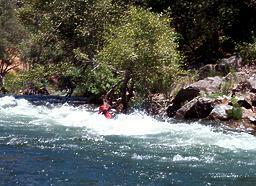 The river funnels into a narrow chute with swift current and big waves at the bottom. The river drops over a gravel bar, collects to the left, passes several rocks (or holes at higher flows), then turns sharp right against a rock outcropping. Good surfing waves below. Some people take out right below to simplify their multi-run shuttles. Almost immediately the river turns right and flows past an old concrete bridge piling, which creates lots of turbulence that is easily avoidable, although you may not think so initially, on the right. Swift water in a narrow channel continues to the bridge. River crosses under highway 49 bridge. Possible take-out below. Finally there is a good legal take-out for Electra Run: a new, paved BLM river access point (the Big Bar River Access Facility) with pit toilet on river left just below the Highway 49 bridge, The whitewater action soon increases. 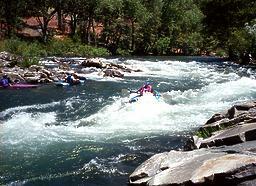 The river turns left among big rocks, past a cliff on the right, and into some big waves. This is rated class III- because the drop is at least 1 meter high, the international standard for making a class II/III distinction. 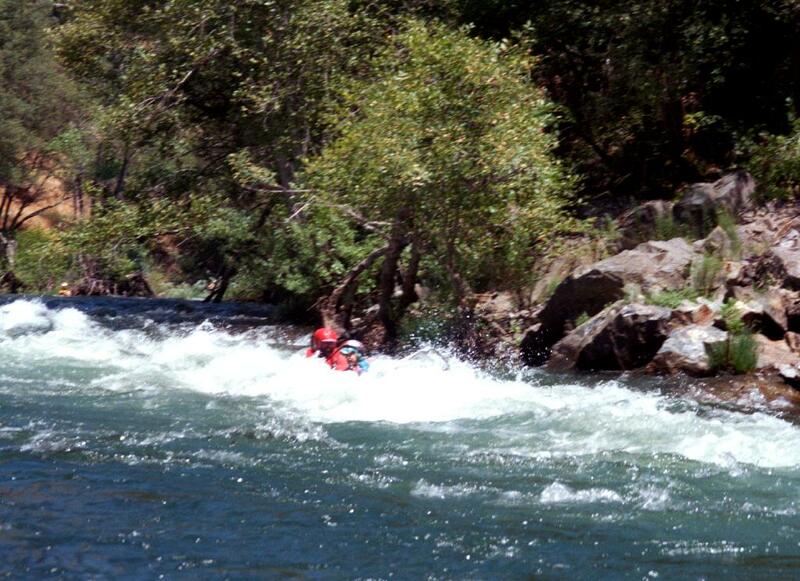 In a hardshell kayak at low flows, this rapid could be quite painful if you struck the underwater rock. But in an inflatable the drop is quite safe and straightforward. At lower flows, you might want to slant a bit towards the right. At higher flows, waves get big, and there is not much of a recovery pool before the next rapid. If you want, eddy out immediately to the left and carry your boats back up a trail on the left bank to highway 49. A sign formerly warned you that boating below this point was illegal, but no longer. After several rapids of decreasing difficulty, the river tapers off to class I-II with superb scenery and abundant wildlife. Typically boaters encounter at least one blue heron. Take out on the right above Middle Bar bridge, noting swank new facilities. 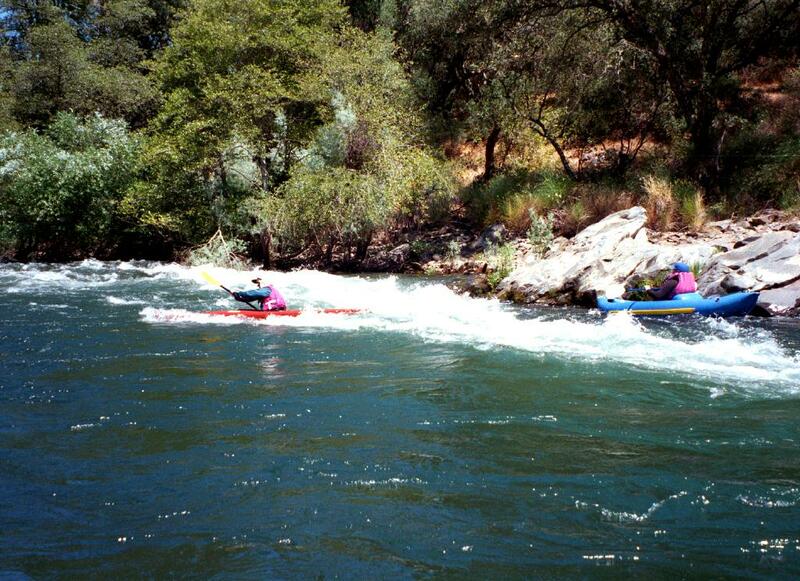 In April 2000, the Calaveras county District Attorney declined to prosecute kayakers Andrew McKinsey and Keith Franklin despite EBMUD efforts to have them arrested for trespassing. In December 1999, Amador county authorities dismissed charges (for lack of evidence) against McKinsey and a larger group of kayakers who took out on the right side under the bridge. These events represented a legal turning-point. 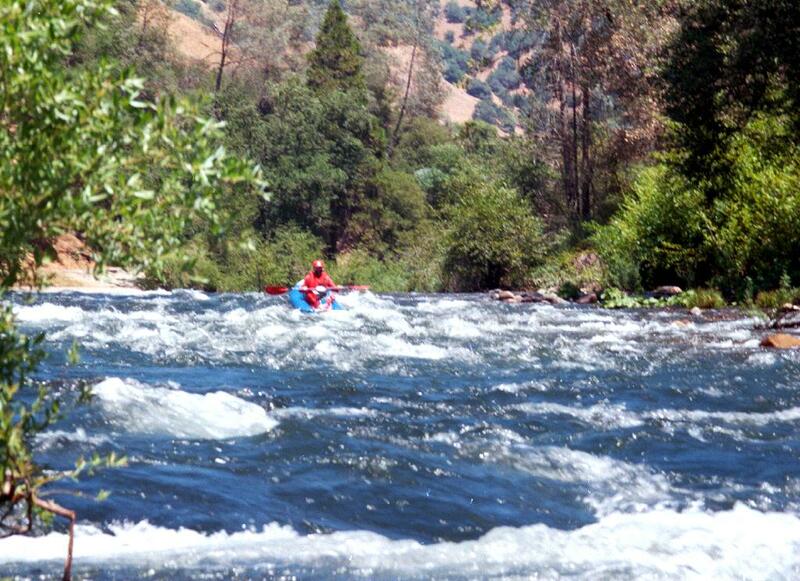 Previously, kayakers had been cited and fined up to $500. 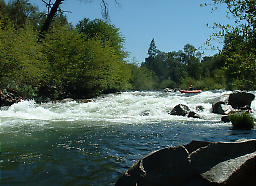 To reach take-out on highway 49, drive south almost 5 miles from Jackson, or north more than 3 miles from Mokelumne Hill, until you reach the bridge at the bottom of the hill. From Jackson, Electra Road is a sharp left turn just before the bridge. Access to Big Bar River Access Facility when heading south is uphill above the bridge; access when heading north is just south of the bridge. 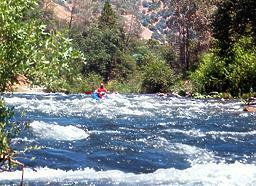 To reach the lower Middle Bar take-out, turn west then south on Middle Bar Road just outside of Jackson where highway 49 starts going downhill, or 2.5 miles uphill of the river if you came from Mokelumne Hill. After a long and winding descent of about 3 miles, Middle Bar Road reaches a new parking lot near the bridge. To reach put-in from the highway 49 bridge, drive up the river on one-lane Electra Road, paying close attention to oncoming traffic. 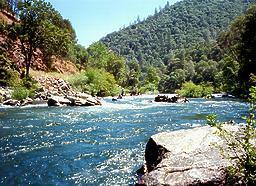 The Electra picnic area, with parking, outhouses, and many non-boaters, is about 3 miles away. There have been frequent reports of vehicle break-ins and stolen materials (especially beer). One good idea is to designate rotating shuttle drivers.